There is a fair argument to be made that Epcot has become one giant festival park. Considering that the park is steeped in the history of World's Fairs, it's a wonder the comparison wasn't made sooner. 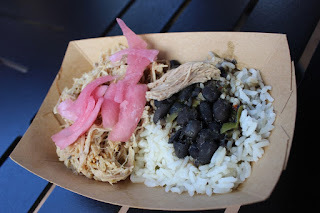 No matter which side of the fence you come down on in terms of the number of festivals and their lengths, I think we can all agree that having delicious small plates to munch on while wandering around World Showcase is always a plus! With the Epcot International Food & Wine Festival returning next week, we thought we'd highlight five of our returning favorites that you definitely need to try this year. Dine well! 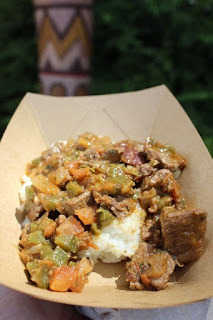 Berbere-style Beef Tenderloin Tips with Onions, Jalapenos, Tomato and Pap (Africa) – There is a ton of flavor going on here! You could be forgiven for thinking all of the flavors would just mush together, and yet you can easily distinguish between the tomatoes, peppers, and okra flavors and textures in the dish. The pap was creamy and great with the tomatoes. Although I would caution anyone that if you’re not a fan of grits this dish could be tough to swallow, but for me it is always awesome! The beef tips for fork tender and the dish has a set of spices that build heat over the course of the dish. These spices highlight the flavors of the dish, not a spicy that sets the world, and your mouth, on fire. 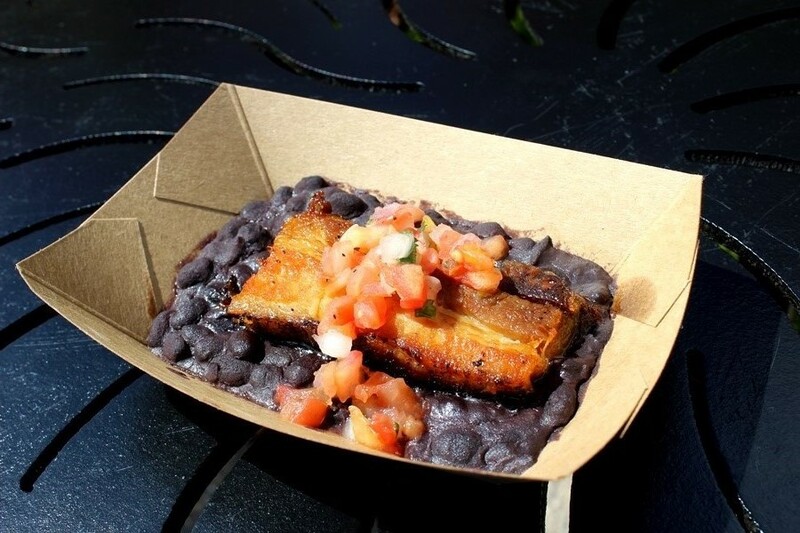 Crispy Pork Belly with Black Beans, Tomato and Onions (Brazil) – Meat lovers and Latin American foodies unite! The base of this dish is a heaping helping of stewed black beans that aren't too soft or too firm, they're just right and they also bring some garlic to the party. The tomatoes and onions are more along the lines of a pico de gallo, but they are always welcome alongside black beans. As for the pork belly, the name may scare you off, but it is little more than a thick hunk of bacon. This piece had a great crisp on the outside and a rich buttery mouth feel from the fat, with sections of tender pork meat. 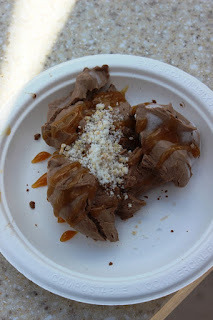 Liquid Nitro Chocolate-Almond Truffle with Warm Whiskey-Caramel (Chocolate Studio) – You have to eat this dish fast, but it is oh, so worth it! It is like the melted center of an ice cream sandwich, not quite solid or liquid, but definitely starting to sweat. Of course, this dessert is way better than any ice cream sandwich I’ve ever had. Rich chocolate with a hint of almond and caramel, this is a total win! Mojo Pork with Black Beans, Cilantro Rice and Pickled Red Onions (Islands of the Caribbean) – The pork flaked apart with the fork and had a wonderful flavor filled with peppers and other spices. The pickled onions were delicious, but not overpowering, with an acidity that balances out some of the more savory elements of the dish. The rice and beans were a hearty accompaniment. I tend to eat one component at a time, but for this item I recommend getting a bit of everything in each bite. 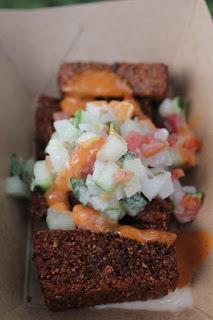 Spicy Hummus Fries with Cucumber, Tomato, Onion and Tzatziki Sauce (Morocco) – This small plate may suffer from the worst misnaming in the entire festival, as these are not some sort of fries topped with hummus and a host of other toppings. While hummus and falafel are both made from chickpeas, I think the word 'hummus' was used in place of 'falafel' as it is a bit more common to most guests. 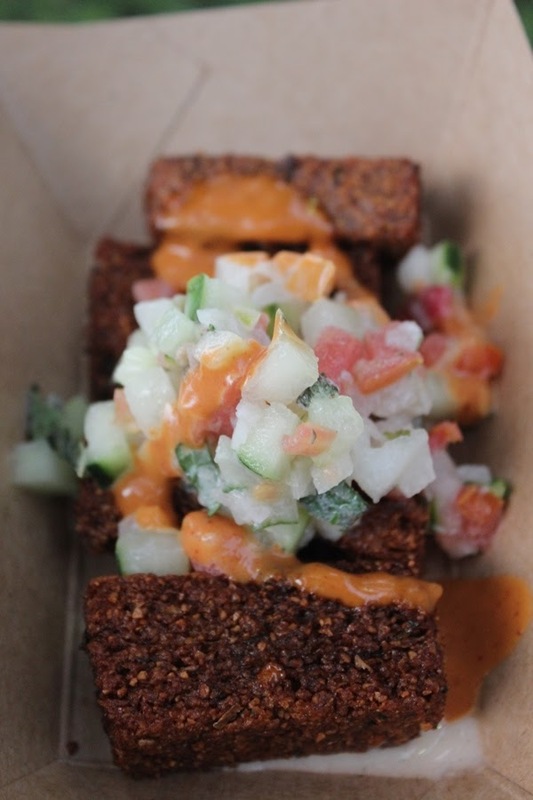 This dish is comprised of several sticks of falafel topped with a spicy tzatziki sauce and a cucumber salad. Nothing here was overly hot, but the spice combination highlights the best of Morocco and the vegetables included are fresh and delicious. The falafel is well prepared and not under or over fried, either of which can happen when they are prepared in this type of volume. As you begin to venture out to this year's installment of the International Food & Wine Festival, or begin to plan your trip, I hope you consider one, or all, of these options! These are some of my returning favorites, and I'm willing to bet you'll find one of your favorites on this list too if you give them a chance! Let us know which of the above ends up being one of your favorites, or if you found something entirely new that really rocked your festival!